Agricultural production opportunities in northern Western Australia have been outlined in a report released by the Department of Agriculture and Food. The department commissioned Growing the north – market opportunities for irrigated agricultural produce from Northern Western Australia to identify high-potential products which suit northern production conditions and export market demands. Department Irrigated Agriculture Executive Director John Ruprecht said the publication would help businesses, industry and investors identify the best market opportunities for irrigated agricultural produce in northern WA. Growing demand for safe, high quality food in Asia and the Middle East is creating a unique opportunity for the agricultural sector of the north, and many products could be grown successfully in northern WA from a production point of view. Eighteen high-potential products have been identified as opportunities for irrigated agriculture in northern WA. These products range from walnuts and lucerne hay to cotton and sorghum. Tobacco was one of the potential crops identified. DAFWA has no plans to assist or encourage industry to establish tobacco production in Western Australia. The discussion document by a consultancy took a preliminary assessment of potential market opportunities for irrigated agricultural produce in northern Western Australia. The document is publicly available and to maintain transparency, no crops were removed from the study. The complete report, as provided by the consultants, was published in its entirety without alternation. The discussion document identified challenges for establishment of tobacco production. Such as in Australia, tobacco requires an excise licence. There are no current licences. Strict rules and conditions apply if granted a licence to grow tobacco. A three-stage screening process was used to understand which products WA’s key target markets want, that could be competitively produced in northern WA. “It identifies agricultural products grown using irrigation, in countries regarded as ‘climatic peers’ of northern WA,” Mr Ruprecht said. “It then connects these with significant demand in growth-markets and countries. This gives us insight into potential opportunities for irrigated agricultural product in northern WA. DAFWA aims to create a progressive, innovative and profitable agrifood sector that benefits Western Australia. “In this role, we are leading a number of irrigated agriculture development projects in the Gascoyne, Pilbara and Kimberley regions,” Mr Ruprecht said. Growing the north is made possible by Royalties for Regions. 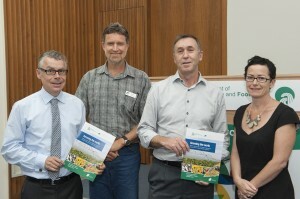 Richard George and John Ruprecht (both centre) from the Department of Agriculture and Food, with Tim Morris (far left) and Virginia Wilkinson, from Coriolis, who wrote the Growing the North discussion document.